Ergonomic design, you can sit comfortably at your desk. Lightweight, durable, foldable and portable -Made of industrial-grade reinforced nylon and premium metal fittings to hold up to 10kg, 2 to 6 times the average weight of a laptop. The rubber feet and laptop grips prevent your laptop from wobbling and minimize vibration. 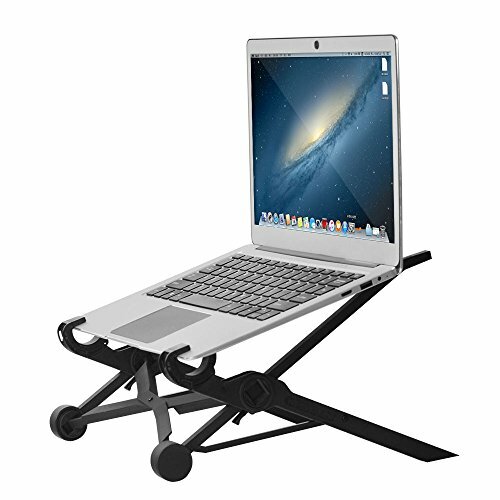 Adjustable laptop stand is offering from 6 inches to 12 inches of lift, with height adjustment letting you raise screen height to eye level for comfort and protection from injury. Helps improve posture over long hours of working at your computer. Ventilated laptop stand helps keep laptops running cooler to prevent from overheating. The stand supports all mainstream laptops and Macbook models 10 Inches or larger and with a front edge less than 2.2cm. It will help reduce neck and back pains, ameliorate your spine alignment, minimize back pains, prevent eyestrain and even eliminate hand fatigue.